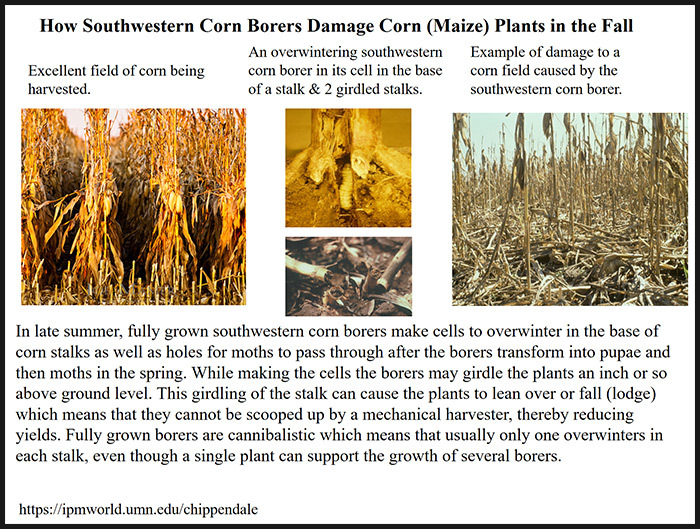 The southwestern corn borer, Diatraea grandiosella (Lepidoptera: Pyralidae), is able to grow and develop successfully on only a relatively few species of wild or cultivated grasses, with maize, Zea mays, being its preferred host. The insect is found in Mexico and the United States. In Mexico, the species has been reported to be present in seven southcentral states, in four northwestern states, and in the Rio Grande Valley, Apodaca, and Rio Brava of the northeast. The species does not appear to be present east of the northern state of Chihuahua or in the central plateau of Mexico. The first official records of the presence of the southwestern corn borer in the United States are in 1913 from Lakewood and Las Palomas, New Mexico. While the insect may have entered the United States much earlier, records are unavailable because the species was not named until 1911. Eastwardly migration rates of 13 miles per year (1913 to 1931), 20 miles per year (1932 to 1953), and 35 miles per year have been estimated. The insect is now established in 13 southern states. The current northern limits of its distribution are southcentral Kansas (38º N latitude), and the species has reached to the western edge of Georgia (85º W longitude).